The vertical quest of real estate developers has given shape to some of the most iconic constructions in the world. But the aspiration to build tall towers such as Burj Khalifa (Dubai), Freedom Tower (New York) or Taipei 101 (Taiwan) would have never been possible without the innovations in elevator technology. While, for many, building high-rises could be a matter of symbol and pride, space-constrained cities have no option but to grow vertically. This offers huge opportunities as well as challenges for elevator manufacturers to work on developing innovative solutions, which not only reduce travel time but are also environmentally-friendly. In case of tall buildings, it’s important to plan the smooth flow of people, right from the design stage. That’s why it’s critical for elevator manufacturers to work with the architects, developers and designers, to evaluate not just the building but also the surroundings and connections to the city.“It is important to consider, for example, how and when people will arrive to the building. Where are the entrances? And what are the intended uses of the building now and in the future,” says Johannes de Jong, head of technology, Kone, adding that this kind of analysis helps determine which solutions are best-suited to the building. Kone has installed its elevator solution in iconic buildings such as Makkah Clock Royal Tower, Saudi Arabia. The 600-meter tall tower has a system that allows up to 75,000 people to leave the building in 30 minutes or less for prayers, five times a day. The world’s tallest tower, Burj Khalifa, has the Otis system in place, with eight escalators and 57 elevators, including 25 energy-efficient Gen2 machine-room-less units and seven SKYWAY systems. The tower has an Otis elevator, which covers the longest travel distance in the world at 504 meters (1,654 feet). It also has world’s fastest double-deck elevators at 10 meters per second (1,969 feet per minute). Otis claims that its Gen2 system is up to 50 per cent more energy efficient than conventional systems. In addition, the Gen2 system’s flat, polyurethane-coated steel belts and gearless machine do not require any additional lubrication, making the system environmentally-friendly. 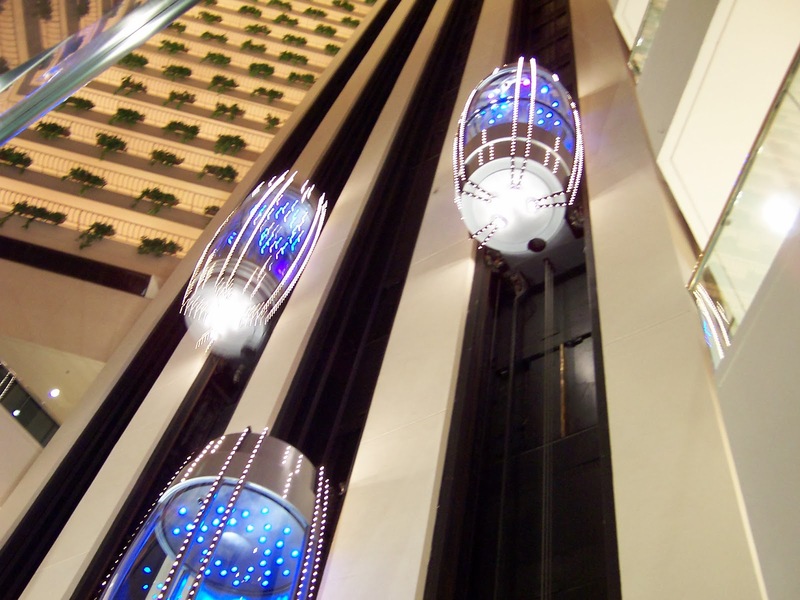 The new technological innovations in elevators are not limited only to high-rises. Otis recently launched GeN2 SWITCH elevator system with singlephase 230 volts supply that is best-suited for low-rise buildings up to 21 metres in height. In this innovative technology, a single-phase mains power supply charges a pack of batteries, which in turn supplies power to the elevator motor operation. In the event of a power failure, the battery pack continues to operate the elevator up to a 100 trips. “Gen2 SWITCH offers customers an ideal elevator solution in areas that face frequent power cuts. A unique proposition of the SWITCH is that it can also be installed in existing buildings easily, using only single-phase power supply. The SWITCH incorporates all the innovative and environmentally-friendly features of the GeN2 range,” says Sebi Joseph, managing director, Otis India. Germany-head quartered ThyssenKrupp, which last year formed a joint venture with Eros Elevators & Escalators by acquiring 25.1 per cent of its shares, offers TWIN-system and double-deck elevators. “We are offering the innovative TWIN-system, especially designed for high-rise buildings. The advantage of the TWIN is that two cabs are running independently in one shaft,” says a spokesperson of ThyssenKrupp Elevator. TWIN system basically provides savings in space as it cuts the number of shafts needed by a third, compared to conventional elevators. “TWIN reduces waiting and travel times to a minimum and helps the elevators to reach their destinations faster. It also saves energy as there are fewer empty trips, increased efficiency and lower material usage,” says the representative from ThyssenKrupp. Buildings consume about 40 per cent of the world's energy, and elevators account for 2 per cent to 10 per cent of a building's energy consumption. Elevator manufacturers are working hard to bring these numbers down. For example, Kone started using regenerative drives that feed energy back into the building network in the early 1990s. “Our regenerative elevator solutions can provide energy savings of up to 35 per cent whereas the escalator solutions can cut energy consumption by up to 60 per cent,” says Johannes of Kone. Otis also has a similar technology called ReGen drives which reduce energy usage by capturing the energy normally dissipated as heat during braking. ReGen drives feed this energy back into the building’s internal electrical grid for use by other building systems, such as adjacent elevators and lighting. Such technology is ideal for low- and mid-rise residential and commercial buildings. Also, in recent years, there has been a lot of focus on reducing the amount of energy used by elevators and escalators when they are not in use. Standby solutions that power down equipment when it is not in use can bring substantial savings. For example, the energy-efficient operation of escalators can cut energy consumption by up to 50 per cent. Energy-saving standby solutions are particularly important for elevators in low-rise buildings. “At small loads and low speeds (low-rise), standby energy accounts for some 70-80 per cent of total elevator energy consumption; but at large loads and high speeds (high-rise), standby energy accounts for 10-15 per cent of the consumption,” says Johannes of Kone. As buildings continue to grow taller and bigger, the challenge of moving large number of people in a short time, along with the need to reduce energy consumption will continue to drive elevator manufacturers towards innovation. What are Supertall and Megatall Buildings? How does the height of building calculated?